Here are 6 of the best IKEA DIODER hack ideas that we have found. First up is a floating LACK cross shelf that doubles as a bedroom side table and mood lighting. It is kept off of the wall by 2 inches using the LACK shelving brackets. You can find the step by step hack guide here. Looking to create some mood lighting in the living room? Here is an indirect lighting idea using DIODER LED lights and a PAX FEVIK wardrobe door – instructions here. 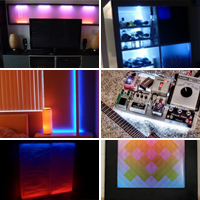 Create an LED room divider using IKEA Dioder lights and an ORGEL paper lamp by following these instructions. A backlit mini bar using DIODER, EXPEDIT, HUTTEN, and RILL IKEA units – DIY Guide. One for the guitarists: a back lit pedal board – DIY Guide. Last but not least is this image changing picture frame. How this works is by painting one image a certain color, and another image a different shade of color on top of each other. By changing the color of the light, only one of the images will show at a time – instructions.